Dark waters fast flowing, white water crests over rapids & reed beds. Opaque water, gun metal grey flavoured with mud. Little islands – ‘ilôts’ – with willow, driftwood & pinky orange cornus reeds. Cormorants & swans. 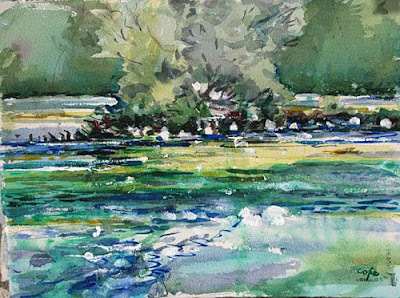 Cold, grey day.Here’s a watercolour study of the same spot but in summer when you can see through the waters to the underworld. Note on the left the silhouettes of the cormorants (properly named, they’re ‘shanks’ actually). 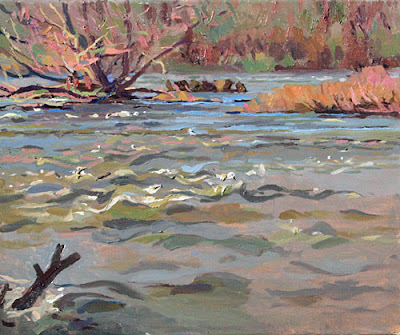 Painting fast flowing water isn’t easy. Sometimes you have to look at it with the eye of a fisherman, studying the underworld beneath the surface. Another but from the other bank, looking down the river to Lalinde bridge. Just enjoying going through your more recent posts having ‘found’ you via Cathy Gaitland whose blog I visit regularly. I too adore her spontaneous Jo’burg urban sketching. 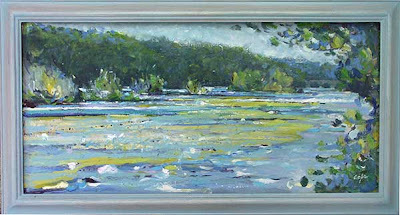 Had to comment, as my son has a farmhouse 4 miles from Lalinde and I spotted your river scene. Must look you up, assuming you live nearby, next time we spend a holiday break there. Love the freedom of your work and the glorious colours. Yes please do look me up when you’re next down here. Stay ‘in the loop’ via this blog if you like.